Time, it moves. Time for a blog entry. The fifth and final season underway. 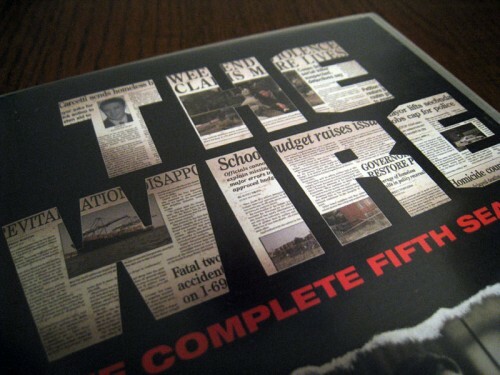 I finished the fourth and fifth season of The Wire. They were good, but not as good as the first three ones in my opinion (I didn’t find Marlo’s gang to be that interesting and the plot was starting to fall apart anyway). Still, very good tv-series. Other news. I went to see Ryoji Ikeda at the Musica nova 2013 contemporary music event. I’ve known Ikeda’s music before, which can be pretty much described as minimalistic static noise and beeps. I’ve heard positive reviews about his performances, so I thought his audiovisual work called Datamatics might be something worth a watch. Well, it was pretty much I expected it to be. The music was pure Ryoji Ikeda, but backed up by some data-like visuals that dances to the noise and the other way around. Lasting just under one hour, it would be best described as a very zen-like, polished and bare boned Assembly 4k demo. And instead of being viewed by computer nerds in an indoor stadium illuminated by thousands of computer screens, it was shown at an opera house to an evening dress audience. Ikeda himself did briefly show up to the audience after the presentation (he seemingly felt quite uncomfortable being in front of an audience), but it made me wonder afterwards how “live” the piece actually was. Did he play around with the sounds and effects or was it all carefully crafted beforehand and just needed to hit play? I’m thinking the latter. Was it worth seeing? Well, yes. Or at least I didn’t feel like I got ripped off. I leave you with a short sample video of Datamatics.